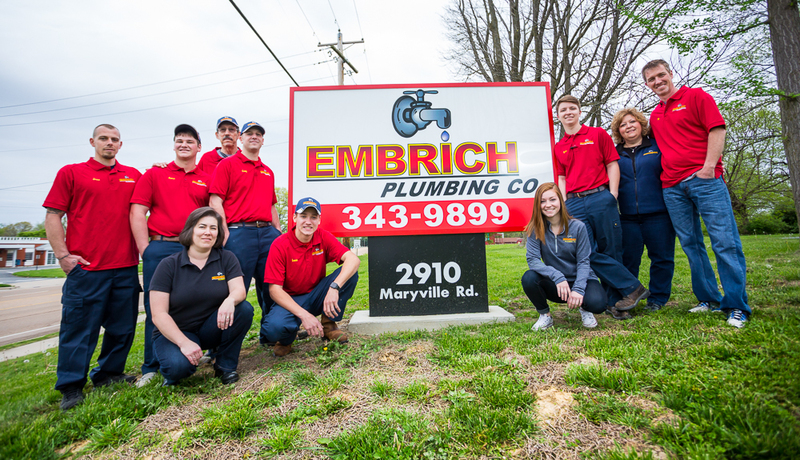 Embrich Plumbing Co is a fully licensed and insured plumbing company located in Maryville, IL. 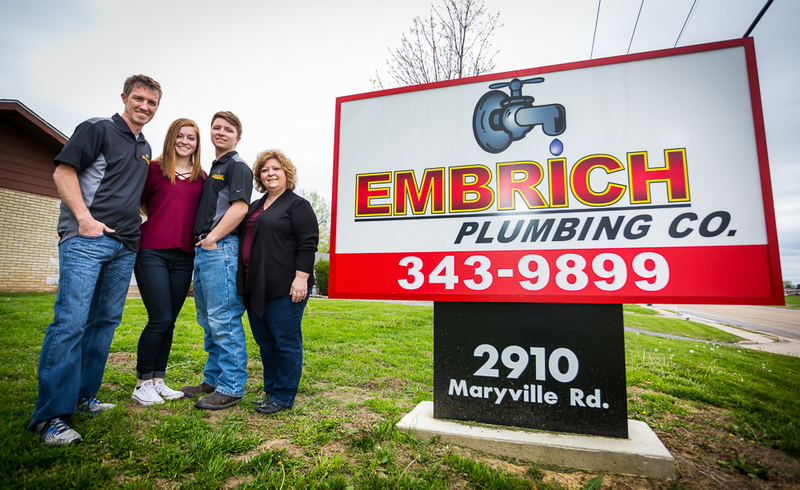 Del and Jen Embrich opened Embrich Plumbing Co. in April of 2001. Their son Tyler joined the team full time in 2014, upon graduating from high school. Their daughter, Bethany, assists in the office when on school breaks. Embrich Plumbing services all residential and commercial gas, water and sewer needs. Customers can count on professional advice, quality work and excellent service, even after the project is complete. Embrich Plumbing Co was founded on the principles of integrity and innovation. Whether performing residential or commercial plumbing, each job is treated with the care and concern of a family member. Embrich Plumbing uses the plumbing industry’s most current technology and training techniques to keep their plumbers up-to-date on the most innovative plumbing solutions. The continued trust of loyal customers inspires pride and a desire to continually improve the business. They strive to offer customers the best value for their money. Phones are staffed 24 hours a day. Contact us today! Embrich Plumbing Co has a team of licensed plumbers and plumbing apprentices to take care of all of your residential plumbing needs. From clogged toilets and faucet change-outs to bathroom remodeling and new construction, Embrich Plumbing is your one-stop shop for plumbing installation, repairs & maintenance. A well–installed plumbing system is only the beginning of healthy plumbing. Regular maintenance will help keep your plumbing running the way it needs to, regardless of the harsh winter weather experienced around Edwardsville, IL. Not only will plumbing maintenance improve efficiency and lower your monthly bills, it can help identify potential problems before they start and schedule a repair session when it can be fixed with relative ease. Whether you are a home owner, landlord or business owner around Collinsville, IL, functional plumbing is essential. Embrich Plumbing can solve your plumbing issues. From residential faucets and water heaters, to drain and sewer lines, to commercial systems like grease traps and drain lines, our plumbers have the right skills and experience to work for you. Day or night when unexpected plumbing problems occur, we will be there to make the necessary repairs. At Embrich Plumbing Co, we are dedicated to eliminating your plumbing problems by fixing them properly the first time at a reasonable price! If you need new installations, repairs or maintenance on your plumbing system, contact us today.